Offering YOU – the customer – the option of having a stain protector applied following your carpet or upholstery cleaning is not just a ‘gimmick’ to get you to part with more money. As previously mentioned, your carpets and soft furnishings are Investments. You have decided to have your Investments cleaned, you have payed ‘x’ amount for the service; to protect your Investments further, doesn’t it make practical and financial sense to have a stain protector applied? You have just had your carpet or upholstery cleaned, and it is now looking clean and fresh. You are offered to have a stain protector applied, but you decline. Several weeks pass then ‘shock horror ‘an accident occurs. Red wine is spilt onto the carpet, and is absorbed into the fibres. Your thoughts are ‘ I’ve just had it cleaned , if only —-‘. The scenario above actually happened to one of our customers. The difference being, they opted to have a stain protector applied after cleaning. Relief, they avoided the expense of calling us out again to address the problem. The stain protector used by Carpet Bright, is water based and is child and pet friendly. It is applied with a sprayer after the carpet has been cleaned, and is then groomed into the carpet fibres, and left to dry naturally. With upholstery, it is applied in the same way as for carpets, and then left to dry – no grooming. The product coats the fibres of the carpet or upholstery, and when dry a barrier is created which protects your carpet or upholstery against staining. 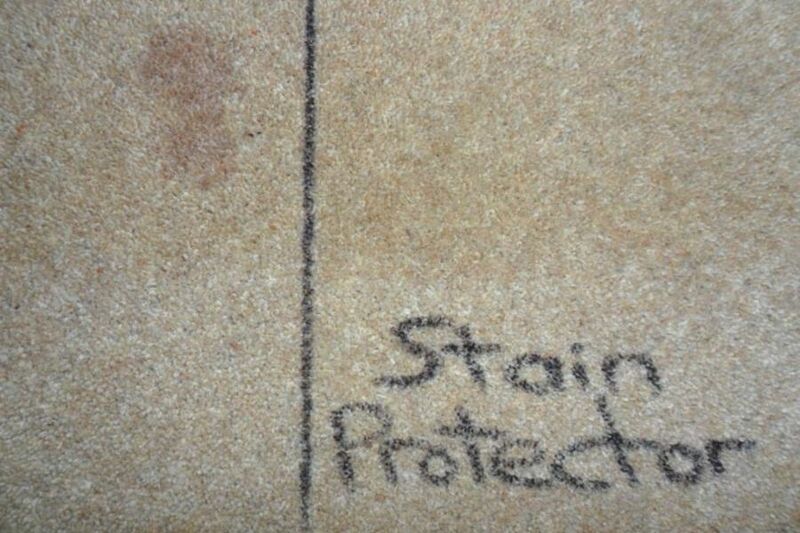 Take a look at the images, and you can see how the stain protector works. 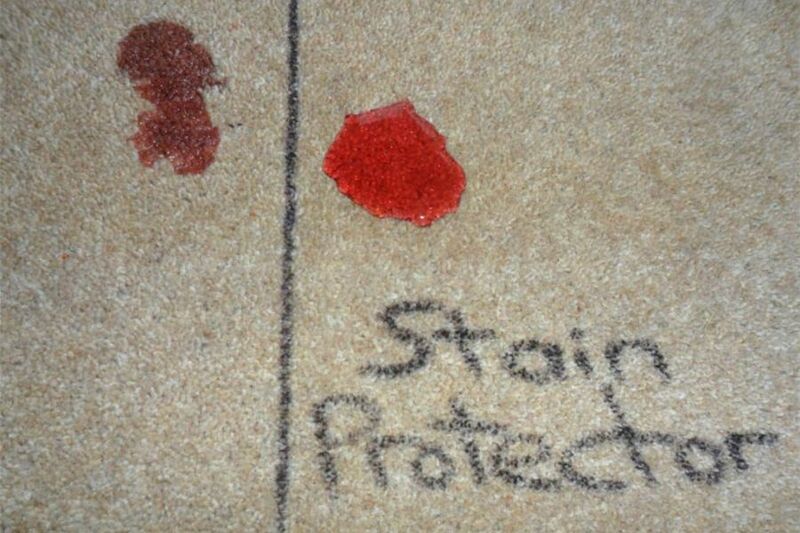 The piece of carpet has no protection to the left of the line, a stain protector has been applied to the right side. 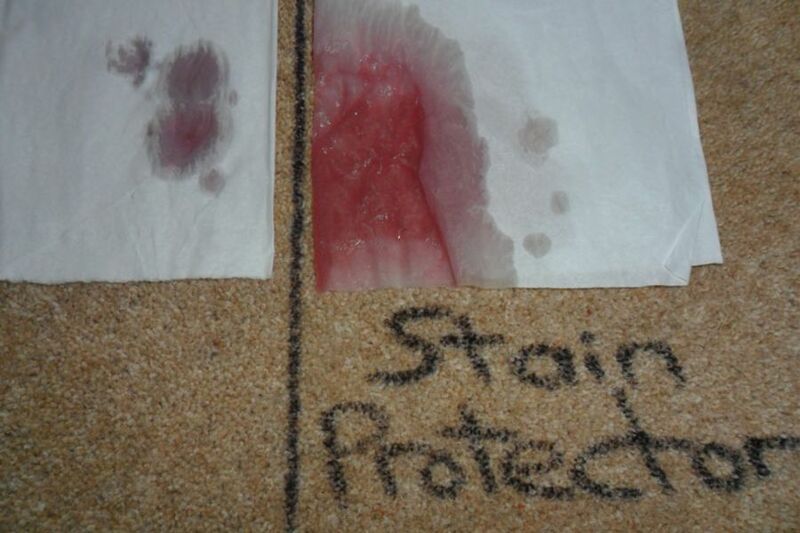 Red wine was used to demonstrate how the stain protector works. Would you like to have a stain protector applied after cleaning? The product used by Carpet Bright works! I know this because a previous customer had her beige coloured carpets cleaned followed by Stain Protection. Several weeks later we were informed that blackcurrant juice and Spaghetti Bolognaise had been accidentally spilt on the carpet. The spillages had been cleaned up without leaving a mark on the carpet. It is recommended that if you have just had your carpets or upholstery cleaned, a stain protector be applied to maintain maximum protection.